Do you have a home, business or community that needs better overall security? Criminal activities have plagued society for generations. Although there has been an increase in crime over the last few years many new security surveillance tactics have been implemented lately to help curtail these activities. Law enforcement recommends a few techniques that will greatly protect your community at a much higher level. Their top 2 recommendations are security guards and security cameras. The latter has proven to be the most effective tool at combating and solving crime. It has been proven that noticeable security surveillance products are the ultimate deterrent. 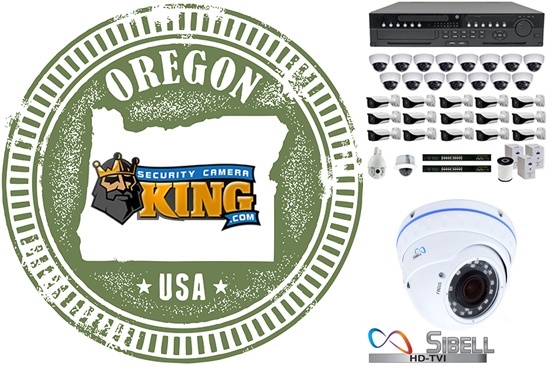 Security Camera King does not just do security cameras Portland Oregon, we cover the whole state. Oregon marijuana laws have shifted over the last few years from allowing medical marijuana to now fully legalizing medical marijuana. OLCC (Oregon Liquor Control Commission) is the agency that manages the marijuana industry across the board. Oregon medical marijuana laws and oregon recreational cannabis laws both have stringent licensing, guidelines and laws that pertain to security cameras. If you have any questions on how to open a dispensary in oregon relating to the security cameras? Ask the cannabis security professionals at Security Camera King. We have done hundreds of dispensaries successfully in Oregon, California, Washington & Alaska. Our team of cannabis security experts and compliance professionals has a one hundred percent pass rate for inspections. A lackadaisical approach to security camera guidelines according to OLCC laws is surefire recipe for disaster. Do not allow your marijuana dispensary to get behind the eight ball. Your security camera installation should be considered in the beginning even before you have planted your first seed. Security Camera King offers many FREE services to our customers. Complimentary security design and consultation is just the beginning of many valuable perks we offer to our clientele. FREE Shipping and FREE Technical Support are just another example of the great lengths we go to provide extraordinary service with our superb products. Our US based technical support is open Monday thru Friday from 9am to 8pm. Our technical support staff can help you with a wide range of services. From the initial setup to remote viewing and configuration of many powerful options available in our security surveillance equipment. Our security techs will help you setup common alerts which can be triggered by motion, sound and heat sources. Do you want to be notified by email or immediately by text message. Sometimes a marijuana dispensary will open and then be forced to move due to different circumstances from a landlord or new town or city code. Not a problem our techs will assist your marijuana dispensary during any types of these disruptions of service. Lifetime Priority tech support for free for all cannabis security systems. Security Camera King products have the longest warranties in the industry. Two and three year warranties for security cameras and digital video recorders are double the norm. We rigorously develop and manufacturer our products in house and in the field before they are ever made available to the general public. A strict set of performance thresholds must be met to ensure that we are delivering the utmost in quality for security surveillance products. Let us assist you if your business, home or community needs an upgrade in protection. Security Cameras Portland Oregon and the whole state of Oregon. Portland, Salem, Eugene, Gresham, Hillsboro, Beaverton, Bend, Medford, Springfield, Corvallis, Albany, Tigard, Lake Oswego, Keizer, Grants Pass, Oregon City, McMinnville, Redmond, Tualatin, West Linn, Woodburn, Forest Grove, Newberg, Wilsonville, Roseburg, Klamath Falls, Ashland, Milwaukie, Sherwood, Happy Valley, Central Point, Canby, Hermiston, Pendleton, Troutdale, Lebanon, Coos Bay, The Dalles, Dallas, St. Helens, La Grande, Cornelius, Gladstone, Ontario, Sandy, Newport, Monmouth, Cottage Grove, Silverton, Baker City, North Bend, Astoria, Prineville, Fairview, Sweet Home, Independence, Molalla, Eagle Point, Florence, Lincoln City, Stayton, Sutherlin, Hood River, Milton-Freewater, Umatilla, Scappoose, Madras, Seaside, Brookings, Talent, Sheridan, Junction City, Winston, Warrenton, Creswell, Tillamook, Veneta, Philomath, Phoenix, Reedsport, Wood Village, Aumsville, Lafayette, Coquille, Harrisburg, King City, Toledo.